After some prodding by Gauntlet, I decided to take a read through The Black Swan and, I must say, I’m glad I did. It’s simply one of the most thought provoking books I’ve read in a long time. So what is The Black Swan about? Well, statistics. And history. And economics. And philosophy. And pretty much everything else under the sun. Nassim Nicholas Taleb doesn’t really touch on politics except for a few veiled shots at the stupidity of thinking liberating Iraq would be a walk in the park, but the black swan principle certainly has some very useful applications to politics - I’ll get to that in a second. First, the book. The Black Swan is about randomness. Not controlled randomness like casinos, but about things that we just don’t see coming that change the world. 9/11 would be a black swan. The dominance of the internet and of Google would be a black swan, because no one would have even conceived of it a decade before it happened. In politics, the 1993 election, featuring the rise of the BQ and Reform Party, would be a major black swan since no one saw it coming. Kim Campbell certainly didn’t think the party of John A would be down to a pair of seats and, at most, the Bloc was just a temporary ad hoc rainbow coalition that no one believed would ever become her majesty’s loyal opposition. 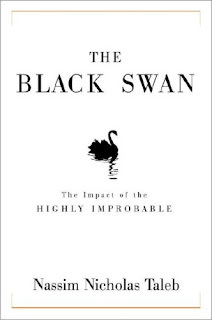 NNT takes this somewhat basic concept of the black swan and explores it from several angles. He divides the world into mediocristan and extremistan. In mediocristan, you don’t get big outliers or deviations. So body weight would be in mediocristan because one person, no matter how many Tim Hortons triple chocolate donuts he eats, will never deviate dramatically from the average body weight. Something like wealth would be in extremistan since a guy like Bill Gates can really skew the average. Events in extremistan are susceptible to black swans which is why war casualties, stock market crashes, and disease outbreaks can come out of nowhere to dramatically change the world. The part of the book probably most relevant to politics is NNT’s rant against “experts”. Most of his scorn is directed against economists whose speculation is hardly ever accurate, but it could just as easily be an attack on political pundits. “Expert” pundits are almost always wrong. Consider predictions for things like election timing, leadership races, or even politicians and elections (Prime Minister Bernard Lord anyone?). Rather than pick on the print media to illustrate this point, I’ll take a shot at myself (since I’m not paid to make predictions, I really don’t mind being wrong). In 2005, I got to musing about the next Liberal leadership race and concluded that the four main contenders for the crown were John Manley, Frank McKenna, Martin Cauchon, and Scott Brison. Three of those guys didn’t run and the other probably wishes he hadn’t. I mentioned the 1993 election before, but the rise of the ADQ, or any of the three government changes Alberta has enjoyed in its history could all be considered political black swans. I think the moral is that politics is rooted in extremistan and that making predictions, especially long term predictions, is an exercise in futility. It also means that things we could never even conceive of today are certainly possible. Maybe that’s why lifelong Dippers or Alberta Liberals stay around in politics. Another beef of NNTs that is especially applicable to politics is his complaint against historians. After taking an undergrad degree in history, I have always felt there was a certain over eagerness to explain everything and make every historical event seem predictable. I think every person alive has had to do a “causes of World War 1” essay at some point in their lives. Maybe the rise of Hitler or the fall of communism were predictable, but when hardly anyone was predicting them you have to wonder if it wasn’t just a fluke that historians are trying to find a logical reason for post hoc. In politics, it seems that pundits (who were 100% wrong beforehand) will pontificate after the fact about how obvious event X should have been to everyone beforehand. Winners are deemed to be political geniuses who ran flawless campaigns and losers are deemed to be inept fools. I can guarantee you that had Martin fluked into a majority government in 2004, pundits would be praising the Mad as Hell tour as a stroke of genius. And by "pundits", I don’t mean just John Duffy. NNT also talks about a lot of problems with statistics that I’m 100% in agreement with. I won’t get into a lengthy lecture on this since I doubt many of my regular readers are bell curve enthousiasts, but the cavalier disregard for outliers and need to normalize distributions has always stood out to me as a problem in statistics. Not so much among people who know what they’re talking about but more so among amateurs. NNT's passionate hate of the bell curve borders on the obsessive and that's probably a little unfair since it does serve it's purpose for normal data from mediocristan - you only run into problems when people toss the underlying assumptions out the door and misuse it. As for the book itself, it’s certainly not an academic text by any means which makes it a fun read. NNT’s sarcasm and jokes (mostly about frenchmen) are sprinkled throughout the book and he can be scathingly critical of those he dislikes. Good for him – it makes it a more enjoyable read. NNT comes across like an arrogant know it all at times but his arguments are generally sound so it’s hard to get too worked up about it. So if you’re looking for a book that will make you think a bit and explain society – something kind of like Tipping Point – I would certainly suggest you pick up a copy. If you’re using statistics for predicative purposes in a field other than statistics, I would insist you pick up a copy. posted by calgarygrit at 11:45 p.m.
By Sean Cummings, at 7:00 a.m. Kudos on owning up to getting a free copy. Most reviews don't include that bit, and it lends significant credibility to your writings. About Black Swans, do you think that Bob Rae becoming Premier of Ontario in 1990 was one of those thing that came out of nowhere, that nobody expected, and changed the face of Ontario politics? 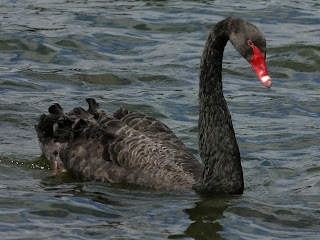 By Mike, at 10:39 a.m.
Mike - I guess it depends on your definition of Black Swan. It wasn't the first NDP government in Canada, even if it was Ontario's first. Maybe you'd call it a "grey swan". If the Liberals had been wiped out and Ontario had shifted to a PC/NDP dynamic, like in England, maybe then you could call it a black swan, but I'm not sure a one term NDP win was really so out of the realm of possibility. I think a Jack Layton win in the next federal election would certainly qualify since, you'd have to go far and above beyond the natural vote fluctuation of the NDP for that to happen and no one in Canada (even Jack himself) would see that as so much as a possibility now. By calgarygrit, at 2:12 p.m.
By JimTan, at 10:14 p.m.
Hmmm! Humans have come a long way since the days when disasters were attributed to the gods or bad luck. How can we manage uncertainty? How can we plan for the unexpected? What do we do when expected events turn into unexpected outcomes? Peter L. Bernstein wrote a non-technical book (Against The Gods: The Story of Risk) describing the evolution of risk taking and management. And, browse the back issues of the Harvard Business Review for stories of different approaches to technological and market risk. Do we read the pundits for their predictions? I think not. There is an old maxim that those who know won’t say, while those who don’t know make free with their opinions. Pundits get into trouble when they are pressured to make forecasts. However, that is not their forte. Rather, pundits and bloggers supplement media reporting by contributing their diverse and timely opinions of on-going events. By JimTan, at 10:16 p.m.
By Technetium, at 10:13 a.m.
Craig Oliver is never wrong.. wait..
By me dere robert, at 12:17 p.m.
By 900 ft Jesus, at 1:43 p.m. It cannot have effect in reality, that is what I think. By www.filmoteca.biz, at 11:56 a.m.
By Yaro Gabriel, at 1:35 a.m.
Looks great! I www.write-my-essay-for-me.com love how "messy" it is... great style! By Lou Pacheco, at 4:52 p.m.
By Pansys Silvaz, at 11:19 p.m.
By Yaro Gabriel, at 2:33 a.m.
By Muhammad Syahrul, at 2:55 a.m.